Amazing! That’s the word that comes to mind when I look back on 2017 and reflect on all that has been accomplished as we’ve worked together. You have volunteered tirelessly and supported generously, allowing us to move closer to our collective goal of better treatments and ultimately a cure for FSHD. As we close the book on 2017, we have much to celebrate. continued to advocate on behalf of our global patient community through focused efforts leading to treatments and a cure. Add to the list a team of dedicated staff members focused on expanding patient education and activating community engagement, and we have had quite a year! I am proud to share with you our FY2017 Donor Impact Report, which further highlights the results of our collective efforts. All of the accomplishments listed (and more) were made possible because of you. With 2018 underway, we are beginning to implement the strategic initiatives which were developed this past year. To serve you and our expanding community better, we have 1) refocused our mission; 2) repositioned our philosophy; and 3) reorganized our infrastructure. Refocusing our mission—For more than two decades, we have worked to “seed” the field, building awareness and interest with the stakeholders necessary to accomplish our goal—stakeholders including families, researchers, clinicians, government agencies, and the pharmaceutical industry. 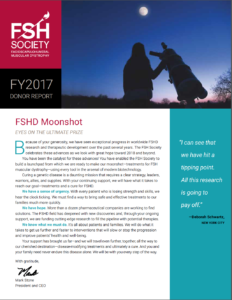 The results above reflect the overwhelming success of our endeavors, and the FSH Society has become the global convener, collaborator, and catalyst for FSH muscular dystrophy research. While we will still be investing in this area through strengthening our advocacy work and encouraging new and innovative research ideas for funding, we are refocusing our resources on preclinical and early clinical development—moving promising compounds through the therapeutics pipeline—to expedite treatments for our community. We understand the elements necessary, recognize our strategic placement within the research community, and are preparing to play a central and pivotal role in developing therapeutics. Repositioning our philosophy—Over the years, we have called on people like you to come and join us in our efforts. Wonderfully, you are among those who answered the call—giving of your time, talent, and treasure—which has allowed us to come as far as we have. Your faithfulness and commitment to support and propel our mission is unparalleled. Reorganizing our infrastructure—Refocusing and repositioning requires reengineering the way we do business. As such, we are investing in two new initiatives. First, we are locating our resources closer to the communities we serve. Through a regionalization approach, we want to operate close to where you live and work, to facilitate your advocacy efforts. Experience teaches us that the most successful patient advocacy groups have a “volunteer-led, staff-empowered” model, which allows everybody to participate in the success of the organization and accomplishment of the mission. Additionally, we are preparing to launch a major FSHD therapeutics initiative designed to accelerate the pace and volume of drug development, getting disease-modifying treatments to our families faster. While space and time prohibit me from a more detailed explanation, suffice it to say that, in combination, these two initiatives are game-changers. We expect 2018 to be a very exciting year for the FSHD community. Thank you again for continuing the journey with us, and for allowing us to join you on yours. Thank you for signing up, showing up, and supporting our collective efforts. You are making a world of difference, and for that, I thank you. Photo credit: Creative Commons CC0 1.0 Universal Public Domain Dedication.